Comments – Mike “Suds” Kane, the Kilkenny player-manager, won the Gold Glove Award for shortstops! LI had Joe DiMaggio patrolling the outfield, while HP had his bespectacled brother Dom. Anyway...... 1949,........ DiMaggio....... and the light bulb went off in my head. I, like many, couldn't wait to plunk my hard-earned lawn mowing money down in the early to mid-70's when APBA announced they were going to issue the 1949 baseball season cards! Since APBA started with the 1950 season set, this was going to be a season no one had a chance to play up until this point! I remembered when they arrived and I remember spending many an hour learning about a lot of these players I had never heard of. I always marked the cards up with pencil in those days, putting in 'batting avg' ‘at bats', and 'homeruns'. It gave me a general idea of the strength and depth of the given team when I would shuffle thru the cards. I have just recently remembered something special about that 1949 set, and more specifically MY 1949 set. I sent my son Alex down to the cellar to look for a box of cards with "1949" on the side. I'm getting to the point now where I know when I croak, he isn't going to appreciate the dozens of card sets I have in the cellar, and most likely they will be included in the dumpster with the majority of the rest of the things I have accumulated over the past 50 years. So I wanted to save this one set, and inform him of the contents. In the early 70's, we had a somewhat major stop on the pro golf tour in Endicott, NY, called The B.C. Open. Named after Johnny Hart, the creator of the BC comic strip. They also had celebrities come in the day before to play in the Pro-Am event. This given year, they brought in Joe DiMaggio. At that time, he would have been around the age of 60. I'm a tad foggy on exact dates, but I think I must have been around the age of 19 or so. 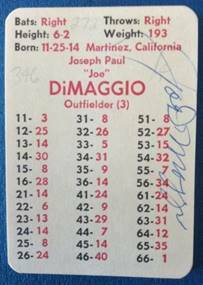 - I took Joe D's card with me hoping to get near enough to him for an autograph. Joe D would hit his drive, then as he was walking to the ball, all the autograph seekers would swarm around him and he would sign as he walked. After a couple of holes of this, the frenzy would start to die down. and then I picked my moment, ran out into the middle of the fairway, and got my pen an APBA card in The Clipper's hands. As he was signing, I quickly blurted out: "Joe, that’s your APBA card!" He didn't have a clue what that was and just looked at me. "Thats a card of your 1949 season! You only played 1/2 a season as you got hurt!" Joe D was handing the card back to me and gruffly said, "I was always getting hurt back then. ".....and kept walking down the fairway. I had his autograph right smack dab on his 1949 card! Joe D was right though, he was getting on in age around that time, and getting injured. 1951 was his last season, it was most definitely his career worst, and at the age of 36 he decided to hang it up. I'm not sure if he met Marilyn Monroe yet, but she would probably be fun to retire and stay home with. Anyway, with Yesterday playing 1949, I thought this would be a good conversation piece to go along with the season. Maybe something to enjoy with a scone and nice cup of Mr. Coffee!